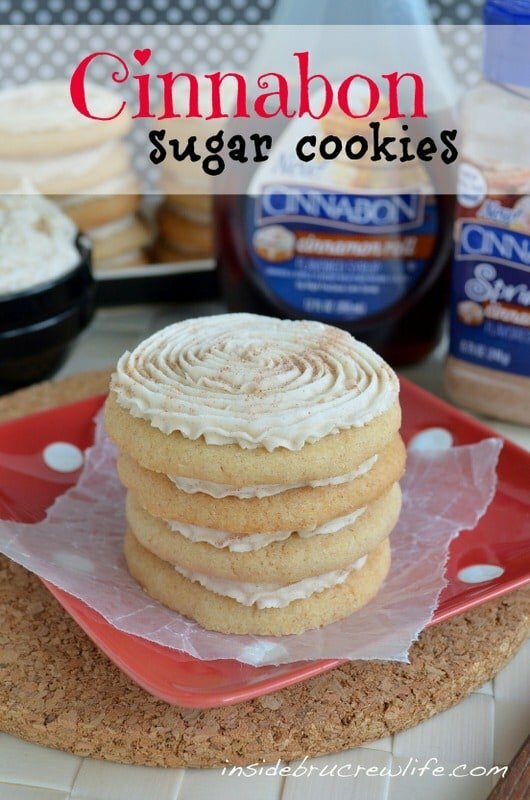 These Cinnabon Sugar Cookies are the perfect cookie to fill your cookie jar with. Are you ready for the holidays? This weekend I had my first of many Eggnog Latte’s. I probably need to google a recipe for making these at home…I like them a little too much! I sure hope you are ready for all the holiday goodies that I have up my sleeves. Well, really they are all swirling around in my brain right now. This cookie was one of those that has been swirling for a while, and I couldn’t wait to make them up and share them with you. They are really easy to mix up and roll out. I like to roll mine about 1/4 ” thick and bake them for 6-7 minutes. 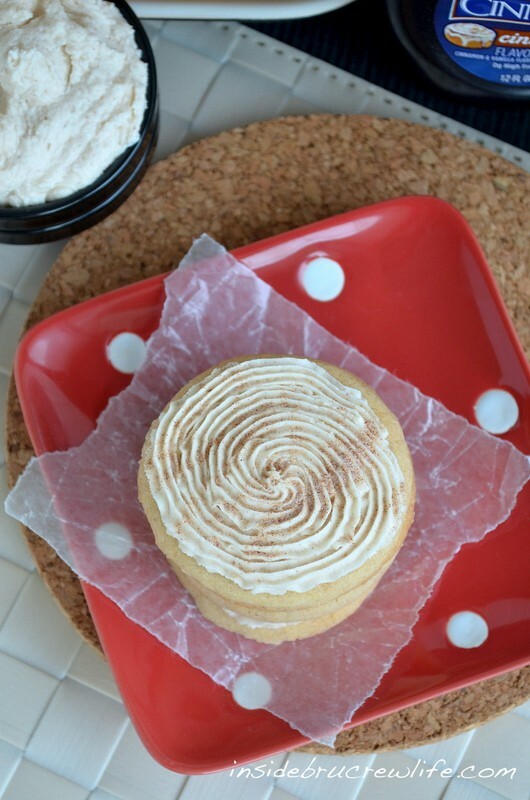 These aren’t not the extreme super soft sugar cookies, but wait for it…swirl on a butter cream frosting and after a day, these cookies will soften right up. And the best part is that they actually keep for about a week. Well, I think they do. We have actually never had any last that long around here. Have you seen the Cinnabon syrup and topping? I found mine at our local Payless (Kroger) grocery store! It truly has the best cinnamon flavor I have ever tasted. I added a little bit of both to the dough and to the frosting! Talk about a Cinnabon explosion going on in your mouth! These were the best sugar cookies I have had…and I don’t know if I will or if I want to go back to regular cookies and frosting. Cinnabon frosting can be other colors, right? I’m thinking Cinnabon reindeer and Santa hats. *As of today (December 4, 2014) I have not been able to find the Cinnabon products in my store or online. I recommend using a cinnamon maple syrup and a cinnamon sugar mixture in this recipe. How do you like your cookies and frosting. I like a good cookie to frosting ratio. Actually I prefer my frosting to be a little bit on the thicker side, but that is just my sweet tooth talking. The good thing about these cookies is that you can put as little or as much frosting on them as you like. Spread it thin with a spatula or pipe it thick with a decorator’s bag. The choice is up to you. 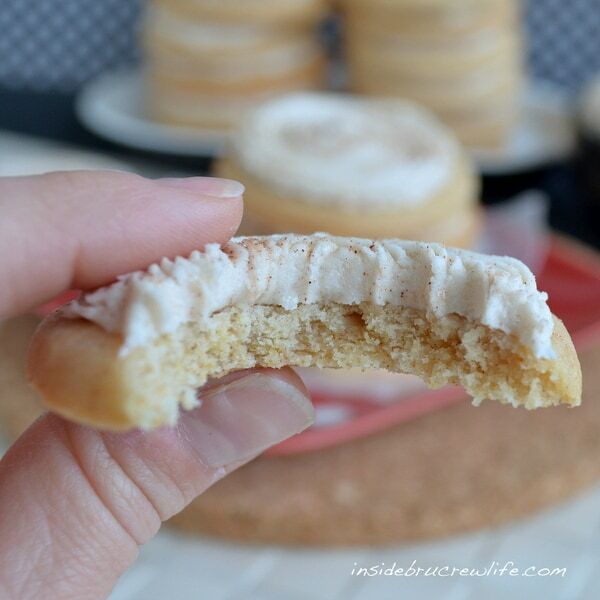 These sugar cookies have a delicious cinnamon flavor in the cookie and in the frosting on top. They never last long in our house. Cream the butter and sugar until light and fluffy. Add the egg and syrup and beat again. Sift together the flour, baking powder, and cinnamon roll sprinkle topping. Slowly add the flour and mix it all in. Divide the dough in half. Place on a floured surface and roll out to 1/4" thick. Cut out circles or whatever shape you have. Remove cut outs. Pat the dough back together into a round disc and roll again. Repeat with all remaining dough. 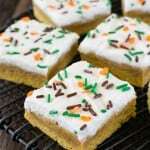 Place cut out cookies on a baking sheet and bake for 6-7 minutes. Let cool completely before frosting. Store in a sealed container. Cream the butter and shortening until light. Add the salt, sprinkle topping, and syrup and beat until fluffy. Slowly add the powdered sugar until all is mixed in. Spread the cookies with as much or as little frosting. Sprinkle the tops of the cookies with cinnamon sugar, if desired. *UPDATED: The Cinnabon products are not available now. Substitutions are suggested in the recipe. Oh wow! What a perfect treat! I almost feel like I could eat one for breakfast. Cinnamon rolls are meant for the morning right? Oh wow! These sound great!! OH MY GOSH!! Pinned! Those look fabulous, and I have a minister that is going to love this. OMG! There is a bakery by my house that is famous for their sugar cookies and one of them is frosted with a cinnamon buttercream! So so good and now I am dying to try your cookies. Do you know if you can pick that Cinnabon stuff up in the store or do you have to order it online? These cookies were very good…probably very similar to that store:-) I found the Cinnabon stuff at my local Payless (Kroger) grocery store with the pancake syrup!!! Wow! These sound too good. I’d bake these just for the aroma. Please drop by our site and leave this recipe on the Holiday Cookie Exchange. This is the perfect cookie for all times! Holy cow, I want one NOW. I need to find that syrup, I can almost taste the sugary goodness. And you’re brave to make that many sugar cookies! I’m not sure brave is the right adjective:-) Insane is probably more like it! I sure hope you can find the syrup because it is so gooooooooddd!!!! I’m dying here. Those cookies look and sound awesome. 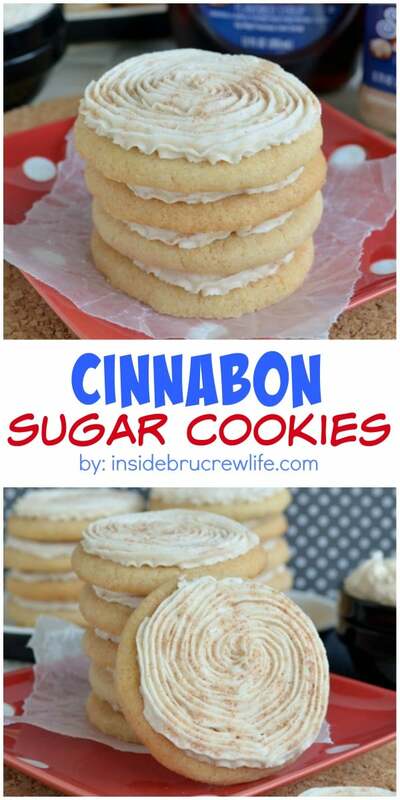 I LOVE making sugar cookies (especially this time of the year) and with the Cinnabon syrup/topping…OMG. I am SO crossing my fingers that my Kroger store here carries it! They really were the best ones I have had in a very long time!!! My fingers are crossed for you too. I found mine with the pancake syrup!!! Good luck!!! These look heavenly. 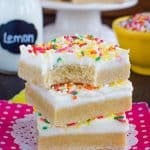 I pinned them and I can’t wait to give them a try! Thanks for sharing. I would like one right now. These look delicious. I have to make these for my hubs. He love Cinnabon everything! I like my frosting to cookie ratio to be pretty even-steven. Cookies with frosting the same thickness just make me smile so much more!! I hope your hubby likes these cookies!!! I bet that syrup and topping would be awesome in banana bread…I’ll have to try that out:-) And it is really incredible on pancakes and french toast!!! Amazing! These look fantastic and I can’t wait to try them! Thank you so much for sharing. I found you at the Melt in Your Mouth Monday recipe blog hop. These are amazing! Love how you put the syrup in both the cookies and the frosting. . .yum! These look great, Jocelyn! 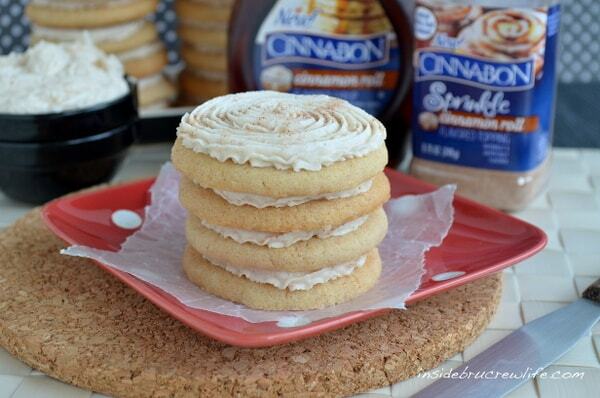 I wish I could get my hands on that Cinnabon syrup or the sprinkles–talk about yummy! You definitely need to find this stuff…it is so insanely delicious!!!! Oo fun! I have those Cinnabon products as well, and I made rice krispie cinnamon rolls with it. But I’ve been meaning to make something else with it, looks like these are a winner. I definitely prefer my frosting thick…maybe even thicker than the cookie! 🙂 And I’m going to keep my eye out for these Cinnabon products and the Gingerbread Oreo cookies in your previous post. I seriously love the holidays and all of the wonderful limited edition products on sale. It’s a food bloggers heaven!! Oh, that is how I like my cookies too…lots of frosting!!! I hope you are able to find both products:-) Definitely a food bloggers heaven!!! Oh – you have no idea how much I love cinnamon! Oh, I wish you could get this too:-( And you are the second person to tell me about that email issue…that Round Up was posted months ago, so there is no reason why you should be getting an email about that! My blog designer is looking into it for me. this looks deelish! i got cinnamon bun pancakes recently and i can only imagine these would be on par with that! this is such a fun idea! the flavors sound so good, they would be great for christmas! OMG!! I have to find that syrup!!! What amazing looking cookies! I have the same thing happen to my cookies. Frosting makes everything better! 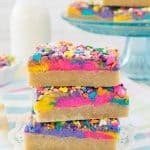 These look so unbelievably delicious! Yum! Yum!!! I wish I had one (or more) of those right now! I definitely like my frosting on the thicker side too. These look great. These look awesome! I will have to try them!! Oh girl, do these look incredible! I have got to find that Cinnabon stuff! Thank you so much Mandy!!! I found it at our grocery store by the pancake syrup…I hope you are able to find it because it is some good stuff!!! I do think I’m in love. These look amazing! Hi! 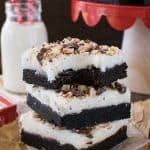 I just wanted to let you know I am including these in a 25 christmas cookies and bars blog post at mommy’s sweet confessions, they look divine! I live in Michigan and can’t seem to find the cinnabon syrup and toppings. Any ideas where I can find it? Jocelyn these look crazy good!! 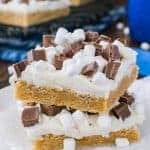 Have try these with my kids this Christmas break!! thanks so much!! Having a hard time finding the cinnabun products. Have my sister looking by Chicago. Nothing so far. Please help! I found the Cinnabon stuff in our local Kroger grocery store. You can go on their FB page and ask where there is a store near you carrying the product. My son LOVES cinnabon…thankfully we do not live close to one…I would love to surprise hi with these. I never realized such products existed! These cookies look outstanding and YES, I want a bite! I found the syrup at Publix near the pancake syrups but can’t find the topping! Where in the store did you find it? I feel like I looked everywhere! We don’t have a Kroger near Daytona! I found the sugar topping right next to the syrup. You could substitute a regular cinnamon sugar mixture, it just won’t be quite the same. That Cinnabon Sprinkle topping is so fantastic. I don’t know what’s in it other than cinnamon and sugar, but SOMETHING is because it tastes worlds better than any storebought or homemade cinnamon sugar combo I’ve had. 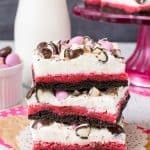 Uh, this has got to be by far the coolest recipe you’ve posted since I’ve started reading. So simple but yet.. genius. I found the syrup, but not the sprinkles. Would you recommend using cinnamon or cinnamon sugar as a substitute? Cinnabon Syrup etc not available where I live! Dang!! Oh, no! That’s not good. Did you try finding it on amazon.com? You also could google a simple cinnamon sugar syrup to make at home? Unfortunately, I cannot get the syrup locally, but I did see it on amazon.com. Just curious- have you tried this with cake flour, or do you think all purpose is best?